In 1937 AASHO decreed that intra-state US routes should either be changed to state routes, or else extended into other states. Perhaps that is why in 1945 the US 166 designation was extended further east, into Missouri, along a route that was arguably unnecessary. 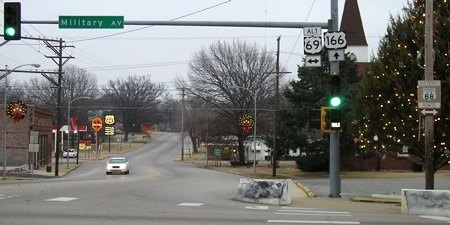 Traffic was directed right through downtown Joplin, on 7th Street, and then continued into Springfield, even though US 66 already served both of those cities. 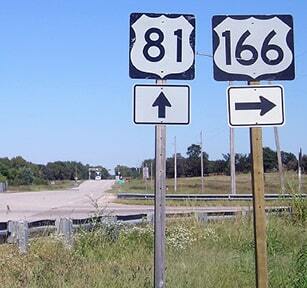 After I-44 was built, US 166 was routed onto a new road that connected with the interstate a bit southwest of Joplin. 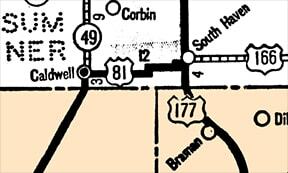 The 1966 DOT map indicates that as soon as I-44 was open between Joplin and Springfield, the US 166 designation was cut back to this interchange west of Joplin, and that has been the east end of US 166 ever since. 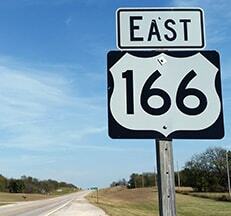 So it is essentially an intra-state route again, although its easternmost 6/10ths of a mile are in Missouri. 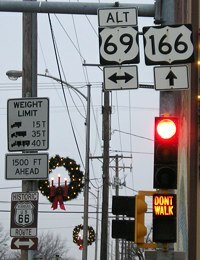 ​US 66 was decommissioned in 1985, so now US 166 and its sibling (US 266) are the only surviving routes that recall the memory of US 66.